Benjamin Netanyahu is set to be Israel`s longest-serving prime minister despite ongoing probes and a tough election campaign against a former military chief. Netanyahu faced tough challenge from the military veteran Gantz, who has the security credentials prized by Israeli’s and a clean-hands image. This referendum was all about Netanyahus character, as hes likely to be indicted on corruption charges later this year. But people in Israel voted for him because they don`t care about some cigars and a few packages. He is suspected of wrongfully accepting $264,000-worth of gifts, which prosecutors said included cigars and Champaign, from tycoons and dispensing favours in alleged bids for improved coverage by an Israeli newspaper and a website. Attorney General Avihai Mandelblit intends to charge Netanyahu in three craft cases, but Netanyahu claim he is innocent but will also stand down if convicted. Netanyahu is called «the magican» and «King Bibi», and he has previously said that the corruption probes were fabricated by opponents who can`t defeat him at the ballot box. Netanyahu became the leader of Likud in 1993 and won the 1996 elections, becoming Israels yongest-ever Prime Minister, serving his first term from June 1996 to July 1999. He worked as a Finance Minister from 2003 to 2005 in Ariel Sharons governments. Following the assassination of Yitzhak Rabin, his temporary successor Shimon Peres decided to call early elections in order to give the government a mandate to advance the peace process. Netanyahu hired Republican political operative Arthur Finkelstein to run his campaign, and he became the youngest person in history of the position and the first Israeli Prime Minister to be born in the State of Israel. Netanyahu`s victory over the pre-election favorite Shimon Peres surprised many. The main catalyst in the downfall of the latter was a wave of suicide bombings shortly before the elections, on 3 and 4 March 1996. Palestinians carried out two suicide bombings, killing 32 Israelis, with Peres seemingly unable to stop the attacks. Unlike Peres, Netanyahu did not trust Yasser Arafat and conditioned any progress at the peace process on the Palestinian National Authority fulfilling its obligations, mainly fighting terrorism, and ran with the campaign slogan «Netanyahu – making a safe peace». He engaged in a major reform of the Israeli economy, which was credited by commentators as having significantly improved Israels subsequent economic performance. During Netanyahus decade in power, Israel`s economy grew nearly 75 percent. Netanyahu retook the Likud leadership in December 2005, after Sharon left to form a new party, Kadima. In December 2006, Netanyahu retook the Likud leadership in Opposition in the Knesset and Chairman of Likud. Following the 2009 parliament election, in which Likud placed second and right-wing parties won a majority. He formed a coalition government. He won electoral victory in the 2013 elections for the third time, and in the 2015 elections for the fourth time, matching David Ben-Gurion for most premierships, and he is the only prime minister in Israel`s history to have been elected three times in a row. This is a historic day for Israel, and one of the secret weapons in this election is the relationship with the U.S president Donald Trump who recognized Jerusalem as Israels capital and recognizing Israeli sovereignty over the Golan Heights. He also delivered Netanyahu a jackpot when he was withdrawing from the Iran nuclear deal. Netanyahus re-election improved the changes of a peace deal between Israel and the Palestinians. «Hes been a great ally and hes a friend. Id like to congratulate him on a well-thought-out race,» Trump said. «I think well see some pretty good action in terms of peace,» Trump told reporters at the White house on Wednesday. «I never made a promise. But everyone said you cant have peace in the Middle East with Israel and the Palestinians. I think we have a chance,» Trump said. Before the inauguration in 2017, Trump assigned his son-in-law, Jared Kushner, to seek the «deal of the century» by coming up with a new Middle East peace plan. Pompeo has also said that they have some new and fresh and different ideas. Kushner said a few weeks ago that the Trump administration will not release its peace plan prior to the election this week. He is working with Trump`s former personal lawyer Jason Greenblatt to present economic elements of the plan to wealthy Arab allies after series of meetings at the Munich Security Conference in Warsaw, Poland. It would be great for Netanyahu if the peace plan is released before coalition formation because that can broaden his coalition. But he has said in the past that he will not divide Jerusalem, even if Palestinians say they want to establish their capital there as well. Jerusalem is a pivot point and that can also disrupt Natanyahu`s ability to hold together a coalition. 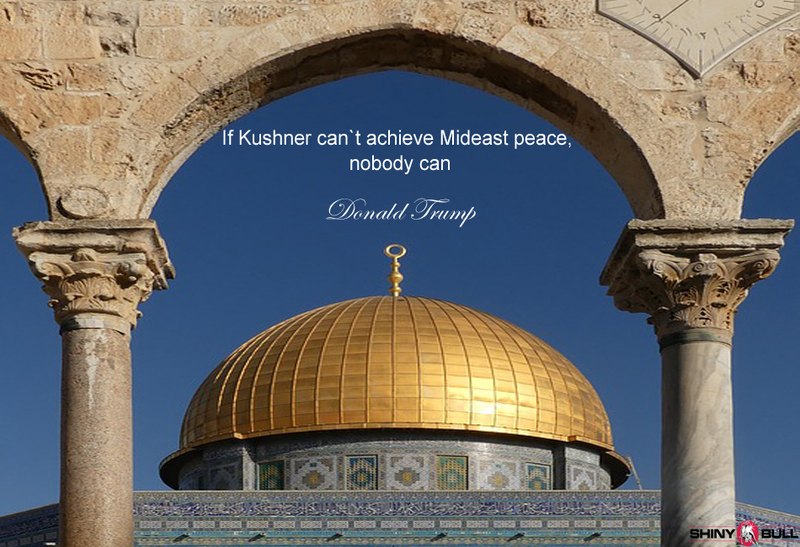 If Kushner can`t achieve Mideast peace, nobody can, Trump said.